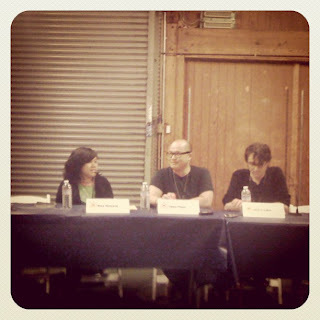 Rina, Thien and Josh recorded the Comix Claptrap live at the 2011 Alternative Press Expo (APE). Here is a recording of what ensued. As usual, the sound quality is not the best, but why would we do things differently just because it's live, right? Our guests were Mike Dawson (Troop 142), Scott Campbell (Zombie in Love), Levon Jihanian (Danger Country) and Esther Pearl Watson (Unlovable). Listen as we talk about their current and upcoming projects, intersecting art and comics-making, thoughts on the APE show, and the experiences with youth organizations. It was fun so you should listen!